“Knowledge of the technical makes creativity possible,” says Arthur Shapiro, Professor of Psychology at American University and Director of American’s newly formed Collaborative for Applied Perceptual Research and Innovation (CAPRI). 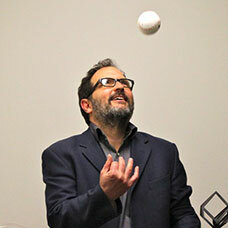 Shapiro is a vision scientist and an internationally acclaimed creator of visual illusions. Many of his illusions have won awards in the “Best Visual Illusion of the Year” contest, sponsored by the Neural Correlate Society. The contest started in 2005, and since then Shapiro’s lab has produced twelve illusions in the top ten, and six illusions in the top three—more than any other researcher or research team. The National Geographic show Brain Games has featured several of Shapiro’s illusions. Shapiro creates visual illusions to study the relationship between our perception of the world, the physics of the environment, and actions of the brain. “My illusions are an extension of my research; they allow me to test hypotheses concerning vision and the brain,” Shapiro says. On the practical side, his visual illusions are part of projects intended to develop effective screening procedures to assess the health of the visual system and even explain why it’s so hard to hit a curve ball. The study of illusions is fascinating in part because it is truly interdisciplinary. “Illusions are of interest to people in many different areas of research. The study of visual illusions draws on research and techniques at the intersection of Art, Computer Science, Mathematics, Neuroscience, Philosophy, Physics, and Psychology,” Shapiro says. Not only do illusions help us understand the brain and the visual system; they also prove to be an engaging way to involve students in STEM- or STEAM-related activities. Students who learn the principles underlying visual illusions find immediate applications of the skills that they have learned in their math, science, and art classes. Shapiro completed his undergraduate work in Mathematics (Computer Science) and Psychology (Cognitive Science) at U.C. San Diego. He received his Ph.D. in Psychology from Columbia University and did post-doctoral research at the University of Chicago in the Department of Ophthalmology and Visual Sciences. He has been interested in illusions ever since his parents first took him to a science museum. He started producing research related to illusions in 2002, following a sabbatical year at the University of Cambridge. In addition to his research, Shapiro is currently co-editing The Oxford Compendium of Visual Illusions.